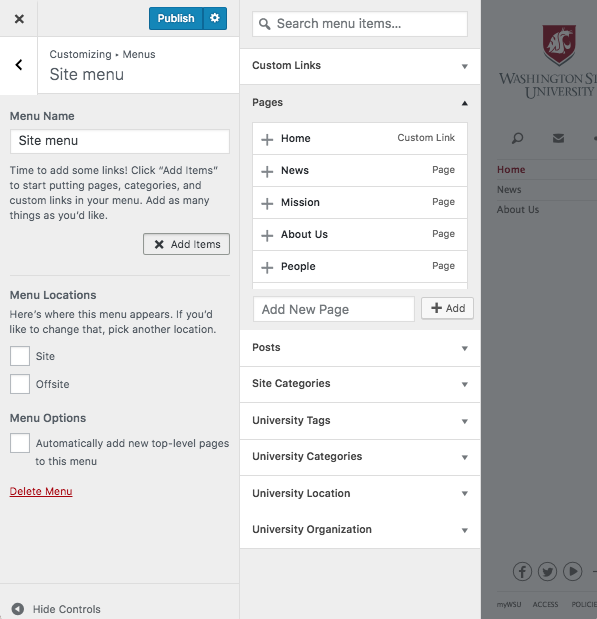 This guide covers the basics of managing the navigation menus for sites using the WSU Spine theme. By default, the Spine theme provides for two menus for the navigation area: “Site” and “Offsite”. As the names suggest, the “Site” menu is intended for providing navigation through your own site, and the “Offsite” menu is meant for linking to any external resources. The two menus have different visual treatments to keep them distinguished from one another. Both the site and offsite menus can be managed using the built-in menu editing features provided by WordPress. The Dashboard page for menu management is under “Appearance” > “Menus”. select the page or pages you want to add, then click the “Add to Menu” button at the bottom of the pane. The “Display location” options under the “Menu Settings” section allow you to set your menu as the “Site” or “Offsite” menu. If you’re on the Dashboard menu page, you’ll notice a “Manage with Live Preview” button to the right of the page title. Clicking it will take you directly to the “Menus” manager panel of the Customizer. You can also access it by clicking either the “Appearance” > “Customize” item, or the “Customize” button in the admin bar if you’re on the public face of your site. Once the Customizer is open, click the “Menus” panel. The process for managing a menu through the customizer isn’t much different from managing one through the dashboard, but it has the added benefit of giving you a preview of your changes as you make them. In my opinion, it also does a better job of breaking down the process and walking the user through it in intuitive steps. You can edit an existing menu by clicking it, or create a new one by clicking the “Create New Menu” button. Creating a new menu requires entering a name before proceeding. You can also select the menu location at this point, but it’s not a requirement. Once your menu is created (or you’ve selected a menu to edit), click the “Add Items” button to surface the panes for different item types. To add an item to your menu, simply click it. If you’re adding a custom link, enter the URL and link text in their respective fields, then click the “Add to Menu” button. Now that your menu has items – whether you use the dashboard page or the Customizer – you can drag them up and down to order them any way you need. You can also create sub-levels by dragging items to the right under the item you want them to be subordinate to. Note: We do advise against adding sub-level items under the top item of your menu, as that creates an awkward and poor usability experience for visitors. Once your menu is organized the way you want it, save it by clicking the “Save Menu” button (on the dashboard page) or the “Publish” button (on the Customizer). within the Customizer, clicking anywhere on an item will open it. when managing through the Customizer, each item on the menu will also have a red “X” on its right when the “Add Items” pane is open – clicking that will also remove the item. As always, don’t forget to save when you’re done. When you create a sub-level under an item, you’ll notice that an “Overview” link is generated as the first item of that sub-level. This behavior is by design. While it may seem unexpected or frustrating at first, the purpose of this is to reserve the parent-level item to serve as the toggle switch for displaying its subordinate items. We don’t want to force users – especially those on mobile devices – to have to load a page before seeing the sub-level navigation items. Imagine trying to look through a site menu on your phone or tablet only to have to the navigation close and a different page load up every time you tried to view a sub menu! It may be helpful to think of the parent-level menu items not as content pages themselves, but as labels for that section of your navigation. That said, you have control over the “Overview” link regardless of the way you structure your menu. enter your new text in the “Title Attribute” field. check the “Title Attribute” box in the “Show advanced menu properties” section. Now you can drag your sub-level items beneath this, without the worry of an “Overview” link being generated. 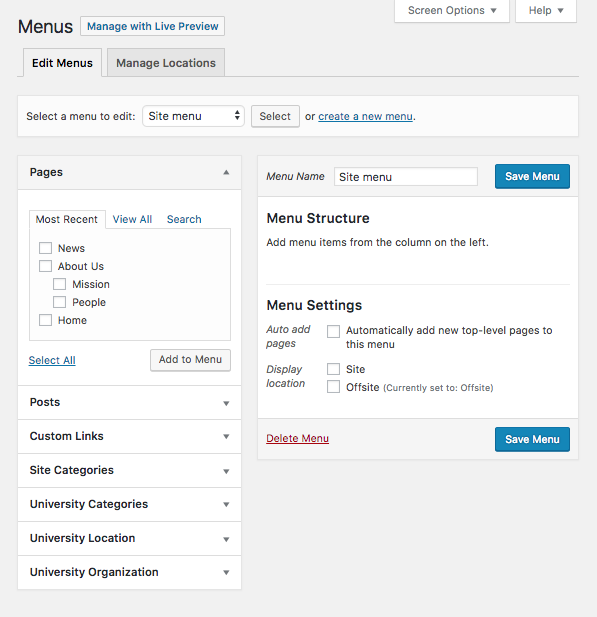 The BU Navigation plugin is available on the platform for those sites requiring a large number of menu items (100+). Comprehensive documentation is available on BU TechWeb. Feel free to contact the web team or stop by Open Lab if your site needs BU Navigation or you need help managing your BU Navigation menu.